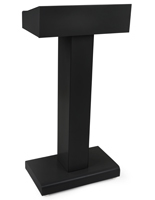 In need of a durable metal podium? Our steel and aluminum pulpits are some of the longest lasting designs we offer. 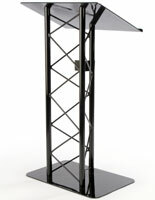 The strong framework ensures the metal podiums will withstand years of hard use by many different orators and speakers. 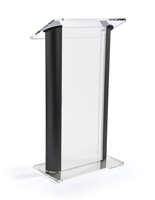 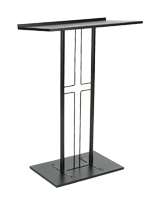 Schools, especially colleges and universities, frequently buy an aluminum lectern or steel pulpit that will withstand years of daily use. 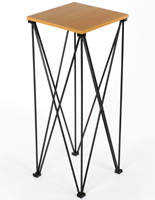 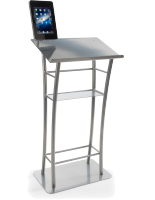 Reading stands made from other materials sustain damage more easily, so it is no surprise that the metal options sell so well. 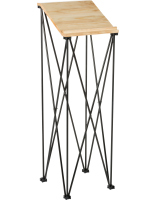 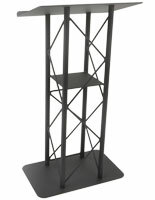 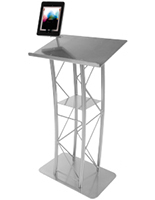 Our inventory includes metal podiums with simple designs as well as more elaborate truss styles, classic designs that mimic the look of traditional reading stands, and contemporary models with integrated tablet computer and iPad mounts. 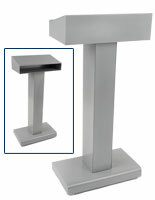 Each design has its advantages for different applications. 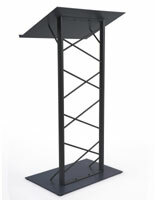 What kind of usability features do steel and aluminum pulpits offer for speakers and presenters? 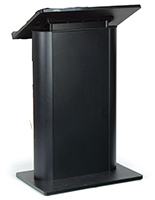 Metal podiums offer ergonomic reading surfaces that allow these lecterns to be used with a wide variety of accessory and source material. 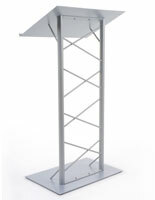 Most of these models feature slanted or angled designs that ensure speakers can easily see and access their copy or notes. 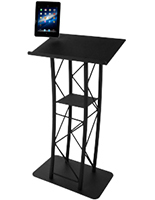 Bookstop depths range from half an inch to more than one full inch, allowing the sturdy stands to accoomodate notebooks, cards, iPads and other tablet models, and even laptops. 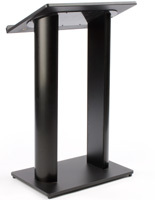 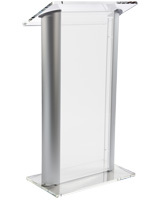 Height adjustable lecterns are ideal for facilities where multiple speakers use the same presentation stands. 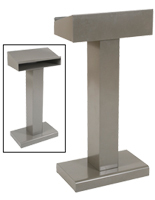 Pneumatic adjustment makes changing these fixtures easy for anyone to accomplish. 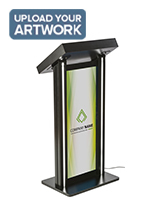 This type of fixture is ideal for conferences, trade shows, meeting halls, business buildings, schools, and even religious and ministry environments. 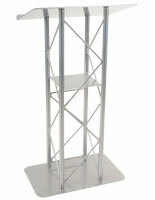 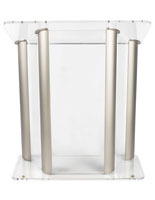 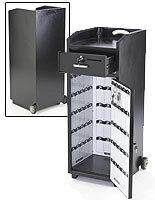 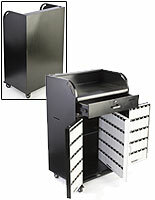 Aluminum valet or hostesss podiums are ideal customer service or greeting stations. 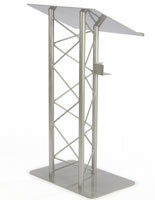 Available in both open truss and enclosed designs, these standing presentation fixtures offer both style and convenience. 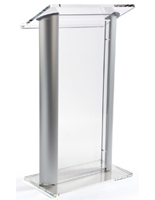 Rear shelving to hold menus or presentation accessories, integrated key storage, locking cabinets, and even built-in lighting present a professional image to customers while allowing staff to work efficiently and safely in the busiest business or hospitality environment. 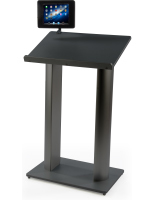 Steel or aluminum lecterns with built-in mounts for iPads and tablets are ideal for presentations, speeches, conferences, and trade show environments that require integrated technological devices. 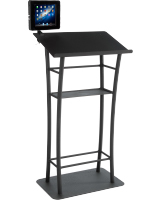 A variety of enclosure mounting styles and configurations are available to address different uses, from user-facing lecture notes presented on an iPad to projector and equipment controls to rotating holders that are ideal for interactive customer service and POS kiosks. 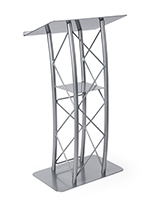 Aluminum and acrylic podiums with dual post uprights are great for modern churches, organizations, and other public speaking venues. The innovative design ensures the speaker is visible and does not detract from his or her presentation. 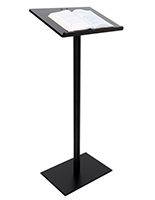 A variety of reading surface configurations are available, from clear plastic with polished edges to MDF (medium-density fiberboard) tops and bases. 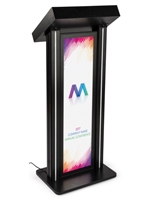 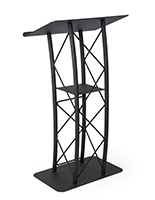 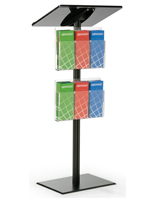 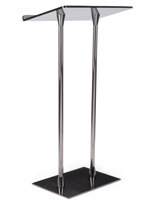 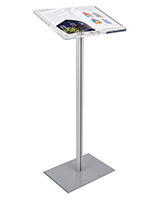 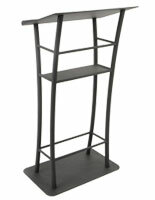 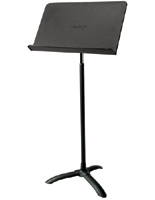 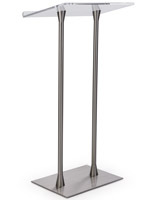 Single and double-wide presentation stands accommodate any speaker, environment, or presentation materials. 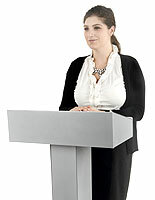 Whether or not the speaking fixtures come assembled is an important consideration when buying steel or aluminum lecterns. 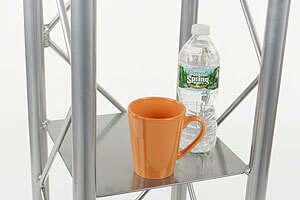 Some units ship as complete units for ready-to-use convenience, while others arrive dissambled and require a little setup on the customer's part. 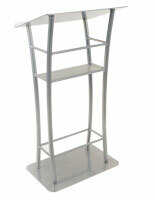 Still others feature pop-up designs designed for easy setup, takedown, transportation, and storage. 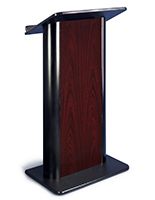 There are advantages and disadvantages about each style that will depend on both the intended use and the location.